(Nanowerk Spotlight) Oxygen is an advantageous battery storage material as it is freely available from the air and does not need to be carried with the other battery components. Unlike the lithium-ion batteries used today, lithium–oxygen batteries do not require metal oxide cathodes to produce electrochemical power, instead generating power from reactions with oxygen in the atmosphere. Air has been widely used in single-use disposable batteries, such as hearing aid batteries. However, attempts to date to use air in rechargeable batteries has not led to viable systems. For example, lithium-air batteries have recently been attempted by replacing the conventional Li-ion battery cathode with air (see for instance: "A nanoscale glimpse of batteries in action"). However, to date these lithium-air batteries have not met with success due to their need for non-reactive resistive electrolytes and the low density of lithium compounds which leads to a low volumetric battery capacity. A new class of rechargeable batteries – 'molten air' batteries – solve these challenges by using highly conductive molten electrolytes and very high capacity multiple electron compounds such as carbon and vanadium diboride (VB2). Unlike prior rechargeable molten batteries, the molten air battery is not burdened by the weight of the active chargeable cathode material. The rechargeable molten air electrode instead uses oxygen directly from the air to yield high battery capacity. "Molten air batteries advance the field of energy storage by opening up multiple opportunities for new higher capacity batteries," Stuart Licht, a professor of chemistry at George Washington University, tells Nanowerk. "These are the first batteries to reversibly use oxygen from the air to store energy via a molten salt and multiple electrons stored per molecule at the counter electrode." In a new paper in the September 12, 2013 online edition of Energy & Environmental Science ("Molten Air - A new, highest energy class of rechargeable batteries"), Licht and his team establish the foundation, experimental demonstration, and proof of principle of a new class of molten air batteries. In their work, the researchers demonstrate three working examples of the new battery’s electron transfer chemistry. They include the energy stored in the battery by the 4 electrons released by carbon, the 3 electrons released by iron, and the 11 electrons released by vanadium diboride. These air battery examples have greater respective intrinsic volumetric energy capacities – 10,000 (for Fe to Fe(III)), 19,000 (C to CO32-) and 27,000 Wh liter-1 (VB2 to B2O3 + V2O5) – much higher than that of the lithium air battery at 6,200 Wh liter-1. 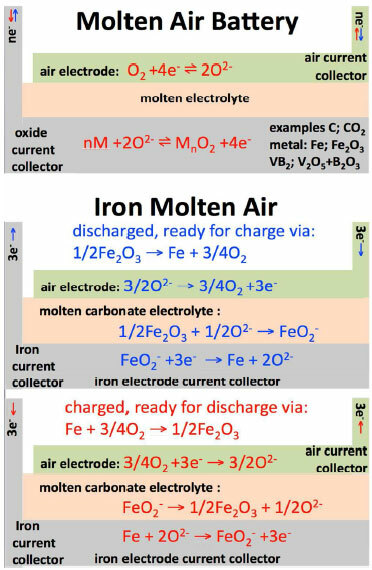 This proof of concept study demonstrates the principles of the molten air battery class with three new batteries. Licht and his team expect there will be new demonstrations of other molten air batteries, chemical explorations of the energy storage mechanisms, and engineering optimization of the cell. "The discharge current of the molten air electrode is sufficient to yield high battery voltages, but could be even greater when a higher surface area between the cycled air and the molten salt will be achieved," says Licht. Potential applications of these molten air batteries could be large scale energy storage for electric grids (for example to store electricity when wind or solar electric is not available); higher storage capacity for electric cars (for example this system has much greater capacity than high temperature sodium sulfur batteries which had been previously investigated); or higher storage capacity for drones.